On the second day of SOLIMED conference, along with Sea-Watch, I have taken part in a workshop focussed on search and rescue in the Mediterranean and its bottlenecks. Many other NGOs were around the table, like SOS Mediterranée, Médecins sans Frontières, Hellenic Rescue Team, Proactiva Open Arms, and many others. One of the subjects was the cooperation between the military and search and rescue NGOs. It has been highlighted that instead of speaking of “military”, a clear distinction should be made between the existing operations of FRONTEX, NATO, Operation Sophia, etc. Indeed, all missions have separate action plans and should not be considered as similar, as it has been experienced in previous missions when some ships agreed to cooperation in rescue operations, and others admitted not to be able to take part in them since it is not in their action plan/tasks. A legal presentation of the environment in which rescue operations take place highlighted the fact that, in this maritime operation zone, multiple legal regimes apply simultaneously. Also, since multiple actors are also involved, many responsibilities are not taken by states who seem not to balance their powers with their obligations. In general, a lack of cooperation between SAR NGOs has been pointed out as hindering the operations when if some logistical and operational elements were shared, then less time would be wasted, and the missions would become more effective. However, all though many NGOs agreed with this, what seemed to be the main cause of the current cooperational situation is the lack of resources. Sea-Watch’s opinion on this matter was to agree on the need of cooperation, but it is first necessary to create strong common pillars of search and rescue at sea before building cooperation modes. There is a need to put the main principles of such operations on paper. The subject of criminalisation of search and rescue operations has been raised by Proemaid since too many of their volunteers have been arrested while rescuing people in distress. This situation should be denounced, as it is a legal and human obligation to rescue those in danger to see their right to life respected. Finally, Proactiva Open Arms has presented a common protocol for rescue operations at sea that could be presented to MRCC Rome, and that could allow a better coordination of the operations in the rescue zone. However, for this coordination to be effective, all NGOs concerned by it should also add some input so all can agree on a common way of proceeding. Many improvements are still to be done to increase effectivity of search and rescue missions, and the more NGOs communicate and cooperate, the easier it will be. See my impressions on the previous rescue operations and the recent incident with the Libyan Coastguards causing around 30 avoidable deaths. Emotions are difficult to keep in, but we need to keep going. When we returned to Mytilene in October 2016, during the same week the citizens of Lesvos finally did not receive the Nobel Peace Prize for their courageous support of refugees both at sea and after arriving on their island. Everywhere in the media still reviews of the last year – and not much about the changes and the current situation. We returned to the place that we had visited only a year earlier, in October 2015, and our memories of that time are still fresh. We want to reflect on the transformations that we witnessed and share some of our impressions. 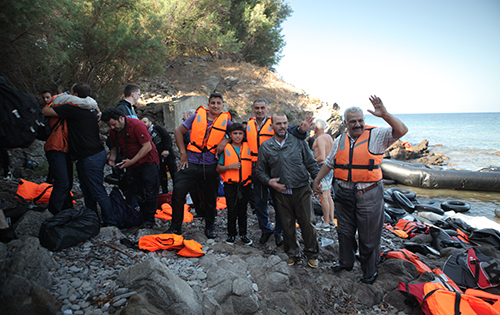 What happened in 2015 along the shores of Lesvos was extraordinary. Many of the boats that landed on the beaches in the north and the south-east of the island had to be assisted. 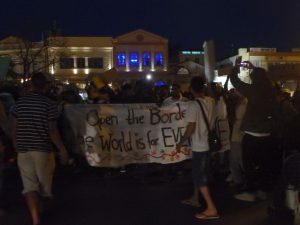 They were welcomed not only by the local residents of Lesvos, whose laudable efforts gained attention worldwide, but, latest from August 2015 onwards, also by people from all over the world, who came to Lesvos to help. In summer 2015, more and more initiatives became involved also in rescue operations, including anarchist groups from Athens, life-guards from Spain, Médecins Sans Frontières (Doctors Without Borders) who cooperated with Greenpeace, a German boat from Sea-Watch, and many others. Activists from Denmark and Spain were later criminalised for their courageous effort to save lives at sea. At that time, push-backs and violence at sea seemed to have disappeared in this part of the Mediterranean. Through the WatchTheMed Alarm Phone we were in contact with more than 1000 boats in the Aegean Sea. In the majority of the cases, we worked in close cooperation with networks composed of Syrian and Iraqi activists, who accompanied thousands of boats via WhatsApp and other digital technologies. At the same time, many people drowned in the waters before the northern coast of Lesvos in October 2015. Without all of these solidarity networks, many more would have lost their lives. While the crossing was still risky, and many suffered severely on the boats, it was clear that once they had overcome the sea, their journeys ahead would be less dangerous. Their movements opened the Balkan route and most of the people we had met last autumn arrived already weeks later in Germany and Sweden. October 2015 was the peak of the ‘long summer of migration’. We can still see and feel the remnants of last year. 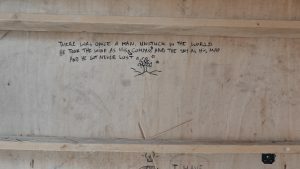 When we went to Korakas in the north of Lesvos, to visit the place of the memorial-plaque which we had erected there in 2010, there still is a watch-post run by Médecins Sans Frontières (MSF) in cooperation with volunteers from Lighthouse relief. 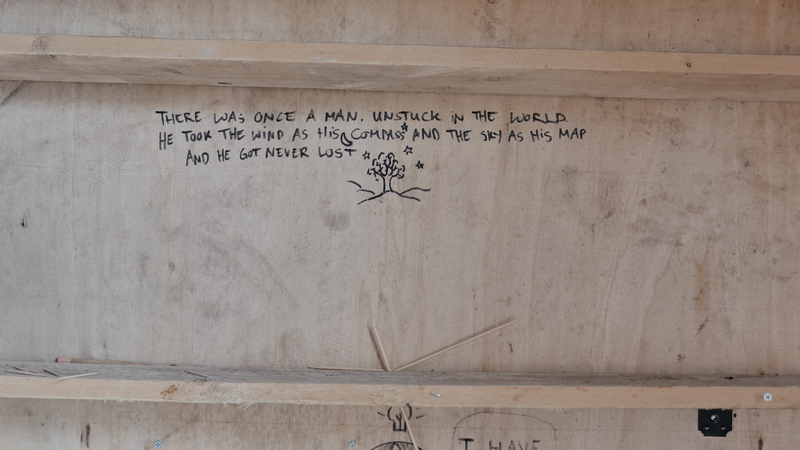 Inside the lighthouse, there are still remains, left behind during the time of so many arrivals. In the beginning of 2016, authorities began to pressurise activists and volunteers working at the beaches to get registered with them. Since then, only NGOs who cooperate closely with the coastguards and Frontex are allowed to be present there. Nonetheless, some others remain present, such as the Greek NGO ERCI in the south, and Proactiva Open Arms, the Spanish life-guards, in the north. Boat-arrivals have significantly decreased since the borders to Macedonia were closed and since the EU-Turkey deal forced those arriving on the island to remain there, in unbearable conditions and continuously threatened by deportations back to Turkey. NATO warships patrol the entire coast. While they hardly ever intervene directly, their radars will detect a lot of the movements at sea, and once detected, they alert the Turkish authorities to intercept the boats. Interceptions and transfers back to Turkey occur daily. Those who finally make it across report that they had to attempt to cross the sea several times until they made it. Some of our friends from Izmir, who join us on Lesvos, give us impressions from Basmane/Turkey, where up until the beginning of this year, thousands passed through hotels while waiting to go to Cesme or other places, to then get onto the boats from there. Basmane now is a quiet place. No life jackets are sold in the shops. Today’s crossings are prepared in a completely clandestine fashion. Nothing is visible anymore, which means also that sea crossing are becoming increasingly dangerous. Exactly one year ago, in October 2015, it was the time of the highest number of arrivals that Lesvos had ever seen. 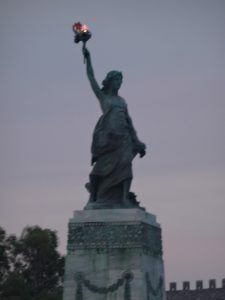 At its peak, 10,000 people reached the island in one day. In October 2015 we spent days mainly near Moria, mainly at night. Back then, the so-called “hot spot” was officially opened, during a time of heavy rainfalls. We were there while the UNHCR and all official NGOs had declared the area too dangerous for their staff. During these nights, only activists and volunteers, mainly women, tried to carry unconscious people out of the mud, covering at least the smallest babies with blankets. The situation last October was described as a humanitarian catastrophe. At the same time, we witnessed then already how EU border regime was trying to re-establish its control. In a common statement between Welcome to Europe and WatchTheMed Alarm Phone, we analysed and described the situation. 100 cars wait in a line, and all sorts of international NGOs work inside the overcrowded “hot-spot”. They keep it running, in close cooperation with EASO, Frontex and the Greek Police. The prison became its own world, with its own rules, a machinery of separation. In the ‘inside’ of the inside, all those are detained in this closed part of the camp who newly arrived and wait for registration. Latest after 25 days, they will leave to the ‘outside’ of the inside, to the open part of the camp. The unaccompanied minors are detained in an own section of the prison and longer, for their own ‘protection’, until a place in a youth accommodation is found for them, sometimes months later. Detained are also all those who are “ready to be deported”, and, in another closed section, those who have in desperation signed the agreement to be “voluntarily returned” to Turkey. 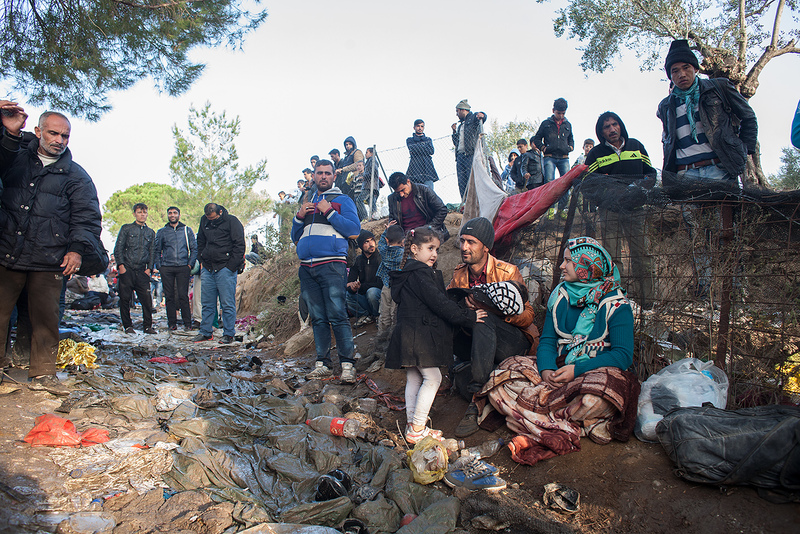 In every corner of the camp you feel how the management of this self-created crisis has turned into a huge business. While volunteers are still present, everyone who enters, even the open part of the camp, is registered properly with one of the NGOs. It is forbidden to take pictures. It is forbidden to distribute information. Three of us got controlled by the police when distributing the Welcome to Greece guide. The refugees stuck in Moria keep asking desperately about their future – and there are few answers to all their questions. Apart from those who have families in other EU member states, there is no legal way to leave the island. They are fed up with so many NGOs passing by while nothing changes afterwards. Nearly every day there are outbursts of violence – among different ethnic groups, often related to the use of the limited space in the overcrowded camp. Regularly there are also riots. Twice, Moria was burning already – but there seems to be no response, hardly any signs of solidarity, and so these upheavals end with several arrests. What we found particularly depressing this year was witnessing how the suffering of refugees seemed to be produced in such an “ordered” fashion. This technocratic system of dispersed violence becomes ever-more difficult to contest. There still is violence, but it seems more invisible now. NGOs present there create the illusion of assistance and support, but they have become part of a system that covers up the ways in which it administers and reinforces the misery of all those who are denied the possibility to find the protection they so urgently need. Over the last years, we took uncountable pictures at the harbour of Mytilene! Farewell pictures of those who left, who were excited to take the next step toward their desired final destination. Welcoming those who are in transit means wishing farewell to them, and hoping to meet soon again, hopefully in a safer place somewhere in Europe. For us, the harbour of Mytilene was a symbol, one crucial leg in the journeys of thousands. Fences surrounding the harbour have destroyed this Aegean point of arrival and farewell. It is not a lively space anymore. Police and Frontex are everywhere. There now are strict controls at the entrance leading to the ferries leaving for mainland Greece. Police vans carry prisoners from the mainland to be deported back to Turkey from here. At the end of our journey back to the border, the friends who joined our travelling group from Athens could not board the ferry to return on Saturday morning. 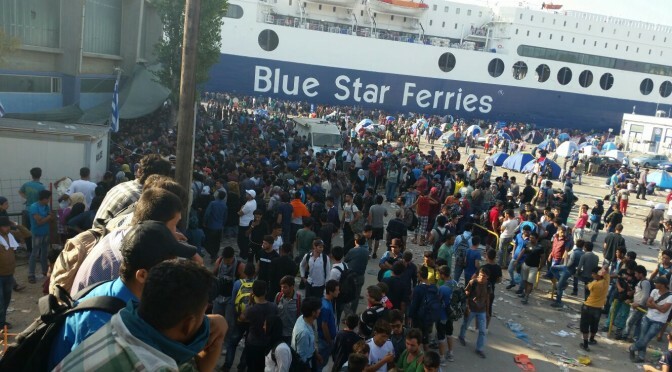 Just as all those who have official registration papers which allow them to travel inside of Greece, they were denied the right to board the ferry, simply because the checking of their papers had to wait until Monday – and then again to Tuesday. Ferries not Frontex acquires another meaning when ferries are used by Frontex to deport. This was the island of welcome – will it now transform into the island of deportations? This question concerns to all of us who have been part of welcoming networks. We wish the residents of Mytilene the strength to resist being eaten out and spat out by the EU’s politics of closure and of denial of protection. The wars in Syria, Iraq and Afghanistan have not ended, they keep on raging. Pakistan and Iran are not safe. People from Eritrea and Ethiopia continue to flee from the oppressive regimes. Somalians run from recruitment by Al Shabab. And so many people have to leave their countries of origin because they cannot survive without the ability to find an income. As long as this suffering continues to exist all over the world, and is created and reinforced by EU policies of exploitation, we cannot be silent when Europe closes its gates. For the Freedom of Movement for All! Last Monday, the 24th of October: Once again a fire destroyed containers where registrations and asylum-interviews were being conducted by EASO, an agency of the European Union. This agency, composed of about 20 officers sent by the different EU member states, coordinates to “facilitate” the registration procedures in the “hot-spot”. The most recent fire damaged 2 and completely burned down 6 of the 12 EASO containers. In reaction, EASO announced to cease their asylum operations for an unspecified period of time, suggesting that their staff’s safety could otherwise not be guaranteed. On the Friday before Monday’s fire, a ferry had been used again to deport people to Turkey. On Saturday, a Pakistani man who had escaped from the closed part of the detention camp got seriously injured when he was beaten up by police. The unconscious man was brought to a hospital but returned into the camp only one day later. This was probably the last straw and people began to revolt. At the same time, migrant uprisings occur continuously and are signs of desperation and suffering in a state of unfreedom. Being denied the freedom to move, these people have to endure in unbearable conditions, always threatened to be deported. Already a month ago, a large section of the Moria camp had burned down. Regularly revolts and outbursts of tensions take place also on the islands of Chios, Samos, Kos and Leros – at places where people are stuck for months. These islands are being used as prisons, and its inmates are not allowed to leave to continue their journey. More than 15,000 people are now stuck on the Aegean Islands (nearly 6,000 on Lesvos, 4,200 on Chios, 2,000 on Samos, 1,900 on Kos and about 750 on Leros). The deportations from Friday, the 21st of October were coordinated by the Greek police and Frontex. Frontex has been actively involved in all deportations from the Greek islands, following the EU-Turkey-deal. Initially, they had announced to deport 162 people, but 103 applied for asylum shortly before, so that, in the end, 59 people were deported to Turkey (49 from Iraq, 3 from Afghanistan, 2 from Iran and 5 from Syria). The Syrians were taken as usual by an airplane chartered from Astra Airlines to Adana, after picking up another 13 Syrians from Kos. Another 54 have were picked up from three different prisons on the mainland (15 from Korinthos, 40 from Peloponnese, 2 from Petrou Ralli); only two of them were directly deported from Lesvos, all others were brought by large police vans onto the ferry from Athens to Mytilene and were then pushed in harbour onto one of the ferries that connects Mytilene with Dikili (Turkey). With the announcement to start weekly coordinated deportations from November onward, Lesvos is meant to become a deportation hub for deportations also from the Greek mainland. Another deportation followed on 27th of October with 41 people being removed to Turkey: 22 of them within the framework of the EU-Turkey deal (13 from Algeria, 4 from Pakistan, 1 from Iraq, 1 from Morocco, 1 from Bangladesh, 1 from Nigeria, 1 from Lebanon, all men). There were 17 negative asylum decisions in second instance, one negative in first instance without appeal and 3 persons resigned from their asylum requests. Another 19 people were deported within the framework of the Greek-Turkish readmission agreement (all of them men from Pakistan, they had not expressed desire for international protection). – 1158 deportations to Turkey took place under the bilateral agreement between Turkey and Greece. – 55 people were deported based on the readmission agreement between EU and Turkey. – 716 deportations were based upon the EU-Turkey-deal. – Another 716 people “voluntarily” returned to Turkey, facilitated by IOM. The new announcement of weekly deportations from Lesvos means that there will be transfers of prisoners from the Greek mainland to Lesvos on a daily basis. Lesvos will turn into the main deportation island of Greece. This is happening silently, without any public attention, since local attention is mostly paid to attempts to remove more of the refugees still stuck on the island. At the same time, the Greek coastguard has hindered even tourists who visited the island for a few days, from returning to Athens. Having visited friends or relatives, many people seem to be stuck for days and keep waiting for checks of their papers, while the authorities need days to verify whether their papers are valid. It is a self-inflicted crisis. The negative image of the situation is produced by the authorities and not by the presence of refugees on the island. For a long time, Lesvos was a place to welcome those newly arriving. This was the case especially last year, when at peak times, 10,000 people arrived daily on the island as part of their journeys to find safety in other European countries. Throughout the world, Lesvos has become known for the openness and hospitality that its inhabitants demonstrated and for their courageous efforts to help those in transit who had stranded on the island. Collectively we should resist EU authorities who try to turn this island into a symbol for Europe’s deterrence policies and stand against these attempts to turn Lesvos into a deportation hub. First video report of my second mission with Sea-Watch. A lot of strength is needed to go through the events to assure effective and secure rescues of those arriving in overcrowded boats from the Libyan shore. Since 2013, Welcome to Europe (w2eu) and Youth Without Borders (JOG) organise journeys for young refugees, to make it possible for them to return to the place where they had first reached Europe: The Island of Lesvos/Greece. This year, the ‘back to the border’ journey turned into a horror trip, especially, for all of us who were without European identity cards. 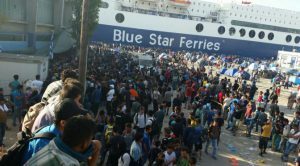 Twice, the police and coast guard didn’t let us take the ferry to Piraeus (Athens) and leave the island as they said they had to re-check the asylum seekers cards for their genuinity – a paper issued by the Greek government itself. We observed dozens of people who were pulled out of the passengers queues at the airport while providing for passports or Greek aliens documents and dozens more who were unsuccessfully trying to leave from the island from the port along with us even though some of them were living and working in Greece for years. 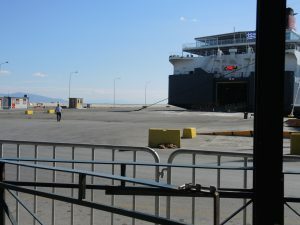 First travel day at the port of Mytilene: Along the heavily fenced entrance to the ferry terminal, travellers get controlled by port police forces and police in uniforms and plain clothes. While we walked towards the ferry the special forces of the coast guard emerged from the dark and came to the entrance of the ferry where first passengers had started entering. The well-trained and big officers wore military clothes and black facemasks while they were equipped with different weapons. We already entered the vessel. Security staff from the ferry asked the non-European looking among us only for their passports. As soon as they saw the asylum seekers cards, they immediately told their holders to step out of the ferry. Special forces of the coast guard told us we had to leave the port and wait for Monday where authorities in the Hot Spot detention centre Moria would work to go and confirm that the documents were real. They informed us only persons whose name is on a list submitted to the port authorities by police authorities in Moria would be allowed to travel. While we were heading out of the port, special forces were checking each truck aiming to travel searching it with 5-6 officers with torches from all sides for stowaways. Second travel day at the port of Mytilene: We entered the first gate to the parking area of the port and reached to the ticket selling kiosk. Another 30-40 refugees were standing at the gate hoping to travel. They had been transferred from Moria to the port for the purpose to leave the island after their documents had been checked by the aliens police during the day. We asked if the list with the names of our friends, which had been send in the morning during our visit in Moria had arrived, but civil port police and special forces denied. After some minutes of waiting in front of the ticket kiosk, the officers started shouting on the refugees waiting there and pushed them by force out of the port area. After they started also shouting on our friends who were standing aside while we tried to find a solution making some phone calls. We told the officers that we are a travelling group and they are with us. Then a police officer started shouting like crazy we should exit immediately the port area. They escorted us with 5-6 officers until the gate of the port that night – even though we all had official documents and even though we had followed their request completely and had checked the documents by police in Moria. This year we returned to Lesvos to support the more than 6,000 people who are stuck, since months, in the prison labelled nicely “Hot Spot” in EU-jargon and in Kara Tepe, an open tent camp run and controlled by the local government. These people cannot leave the island due to the dirty EU-Turkey deal and simply because they are humans who do not possess the right papers. Nowadays, all those travellers who are not white and not European are being subjected to racist controls. Even a member of the European Parliament, who is black was controlled for two hours recently. 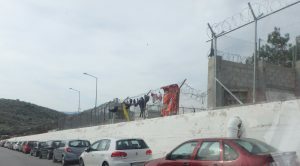 Lesvos Island was turned into a prison since March 20th and has become as a whole a border with heavy controls and high fences, which is the opposite of a cosy and beautiful tourist attraction. 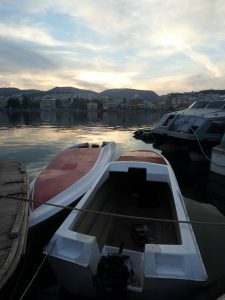 The youngest member of our group, who is not even for years old asked: “Why don’t they let us go on the ferry?” Despite having a German passport, she demonstrated solidarity and stayed on the island with all those who could not travel. Happily, she didn’t notice when ferry staff upon our final boarding at the third travel day, tried repeatedly to convince us we had to sit in this special corner where later all non-European (documented) travels (who had purchased their tickets) were seated. What would you answer the child, if it asked why? Stop turning Lesvos and Greece into a prison and a depository for the unwanted of Europe!